The Amazon is not only the largest river in Brazil, but also in the whole world. Its total flow is larger than that of the rest of the next rivers in the top ten list combined! It is approximately 6,937 kilometers (4,300 miles) in length. The Amazon also flows through Peru, where it originates, then through Columbia, Bolivia, Venezuela, Ecuador and Guyana. No bridges are built anywhere on the Amazon, because most of it flows through tropical rainforests and other undeveloped territories. It eventually drains out into the Atlantic Ocean. Its basin covers approximately 40% of the South American continent. Over a third of all species in the world are found around the Amazon, and it is especially diverse when it is in the Brazilian tropical rain forest. One unique species is the Amazon River Dolphin, also known as the boto. Some dangerous carnivorous life exists in the Amazon, like piranhas and anacondas. 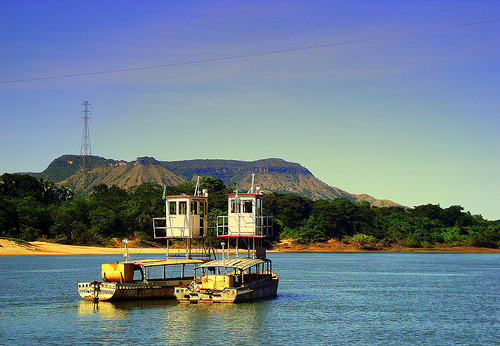 The Sao Francisco is 2,830 kilometers (1,760 miles) long, and is the longest exclusively Brazilian river. It originates in the central-western part of the country, in the Canastra mountain range of the state of Minas Gerais. For most of its course, it runs northward, going through Bahia, Pernambuco, Algoas, Sergipe and eventually into the Atlantic Ocean. It has historically been a river of cultural integration between these different areas, but navigation of the river has declined in recent years. The Tocantins River flows only in Brazil, and it goes from south to north for about 2,640 kilometers (1,640 miles). It is not a part of the Amazon, but its waters do empty into the Atlantic Ocean. It begins in the mountains around Pireneus, and then flows through the state of Para. The geography around the Tocantins River is very interesting, as it is composed of flat, broad clay valleys with bluffs off to the distance. The government is developing a dam around the state of Para. 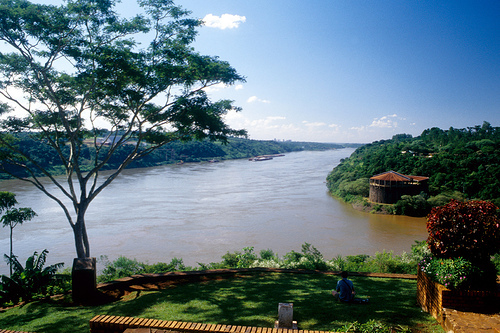 The Paraná River begins in Brazil, and runs through Paraguay and Argentina for about 2,570 kilometers (1,600 miles). Its source is the confluence of the Paranaiba and Grande Rivers, in the southern part of Brazil. It forms the boundary between Paraguay and Brazil when it meets the Iguazu River. Along this river is the Itaipu Dam, which is the second biggest hydroelectric dam on earth. 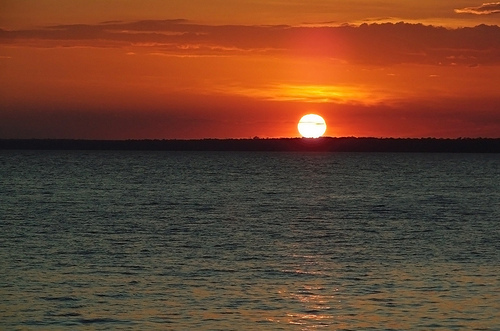 The Paraná River eventually flows into the Atlantic Ocean through Argentina.